Here are some ideas for summer sleeping! 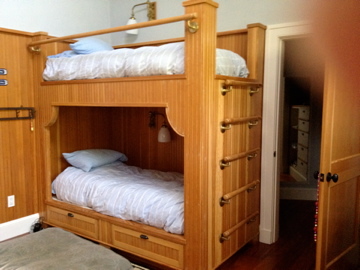 The first is a bunk bed,made by the builder for a house on the Vineyard. What I loved was the rungs on the side to scramble up to the top bunk. I thought it was all very nicely done. 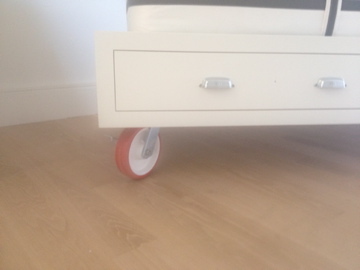 The second example is a set of twin beds on these big red wheels. This is so clever-the beds can be moved around easily to create a double bed or two singles. Great idea for the many visitors with different needs that arrive in the summertime! This entry was posted in summer/beach houses and tagged Bedroom, Bunk bed, Children, Concord Falmouth decorating summer bedrooms, Falmouth, Furniture, Martha's Vineyard, Summer house. Bookmark the permalink.